“Jesus called a child over, placed it in their midst, and said, “Amen, I say to you, unless you turn and become like children, you will not enter the Kingdom of Heaven” (Mt. 18:2-3). 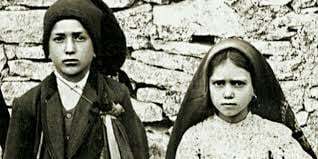 October brings to mind the Miracle of Fatima that confounded the world. We are amazed at the events through which three little children capture the attention of a troubled world with their stories of a beautiful Lady and their universal exhortation to pray the rosary. These little children, two of whom are canonized saints, show us the short path to holiness to which we are all called; put your hand in the hand of our Mother, as little children are wont to do, and walk with her. Francisco, a boy of eight, prays many rosaries and offers many sacrifices to comfort the heart of Mary. His bravery, when threatened with being boiled in oil for his testimony to the truth, is beyond what we can do…without God’s help. Jacinta, not quite seven at the first apparition, offers many penances and sacrifices for poor sinners. She dances in prison among the criminals. And she dances to cheer her family, with tears streaming down her face when an older brother is killed in battle. The children give away their lunches, go without satisfying their thirst, and pray many prayers to atone for sins which so sadden God. They wear an uncomfortable rope around their waists and offer the misunderstandings of parents, priests and government officials. It is for love of you, Jesus, and for the conversion of sinners and in reparation for the outrages committed against the Immaculate Heart of Mary.